2CD set bringing together the Moon Hop and Derrick Morgan In London albums, plus bonus tracks compiling all the singer’s work for Pama Records………LTW’s Ian Canty meets the man who put the moon in Skinhead Moonstomp…………..
Derrick Morgan was only three years old when he was sent to Kingston to live with his mother. Having been initially raised in the small rural settlement of Stratton by an aunt, the youngster’s poor vision was giving cause for concern. In the hope that the doctors in the big city could help remedy the situation, he made the journey. Unfortunately the medical experts could offer no real hope of improvement and Derrick settled into life in the capital. Becoming a fan of the American R&B that kept most of the island’s youth rapt, he entered the Vere Johns Opportunity Hour, a talent show that was the starting place for many a future star including the Wailers, Desmond Dekker and Millie Small. Singing a couple of Little Richard numbers, Morgan triumphed and as a result spent a couple of years performing alongside popular Jamaican comedians Bim and Bam. After that Morgan looked to make waves on Kingston’s recording scene. He successfully attended an audition for Duke Reid and the tracks he set down were aired on the Duke’s radio show. This was his big break. Work for other producers followed, but Derrick really hit the big time with a track he cut for Simeon “Little Wonder” Smith entitled Fat Man. This was a big Jamaican hit and set Morgan on his way to becoming the top star on the island. Morgan’s gutsy vocal style was well suited to R&B and the Ska craze that followed, often in duet juxtaposed with a honey-voiced partner like Hortense Ellis or Patsy Todd. As the beat slowed with Rocksteady and smoother voices generally prevailed, he slowed down his recording schedule but still scored with strong material, including another of his key recordings Tougher Than Tough. He also made his first moves in production and by the time of the offerings on Moon Hop: Expanded Edition he was producing the majority of his own work. By 1968 the interest in the UK for Jamaica recordings was reaching fever pitch. Trojan had set themselves up as the leading power in UK-issued Reggae, but Pama Records were running them a close second. Set up in the mid-60s by the three Palmer brothers Carl, Harry and Jeff, the label had switched over from Soul when the demand for Ska and Rocksteady records rose. They licenced many disc that were big favourites of both the Jamaicans now settled in Britain and the new young fans of the sound. Pama’s almost crude graphics (particularly for the Punch label, which mainly released Lee Perry productions) worked in their favour, as the rough and ready approach perfectly dovetailed with the skinhead attitude of the time. Trojan and Pama became rivals, something that was exacerbated by some JA producers selling their wares to both labels (including Seven Letters by Derrick, which appeared on both Pama and Trojan) – often resulting in a mad rush to get a disc out and up the charts before one another. 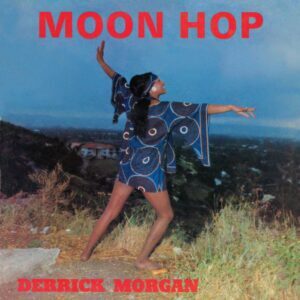 Derrick Morgan was the ace in Pama’s pack and his Moon Hop for the label so nearly gave them a hit on the national charts. With the Apollo moon landing in July 1969 the whole world seemed momentarily obsessed with space and Morgan’s single was trailed by a great, slightly daft press advert (reproduced in the booklet here) which proclaimed “Derrick Morgan was the first man on the moon and he brought back a new dance called the Moon Hop”. The record had an irresistible drive and the Yeah Yeah Yeah etc refrain went down very well with the fans. So much so that Symarip’s Skinhead Moonstomp was released in its wake, sounding somewhat similar to Moon Hop to put it mildly, with only the spoken intro and guitar differentiating it. Soon after the first collection here was released on Pama early in 1970, titled after the near hit to capitalise on its success. It was pretty much state of the art as far as Boss, Original or Skinhead (take your pick) Reggae was concerned. Twelve upbeat chuggers, ten of which saw release as singles on Pama’s Crab offshoot, all built for dancing and as sharp as the crease in your dog-tooth strides. Derrick had the happy knack of being able to craft catchy stormers that ruled the dancefloors and stick pleasantly in the mind. Starting off with the Skinhead-inclusive A Night At The Hop, Morgan follows with the wind tunnel effect of Man Pon Moon, a sign that he employed no little innovation in his productions. This was emphasised by Derrick Pop The Top, a proto-Dub recut of his Fatman hit of a few years before. Give Me Lovin’ (unreleased at the time this album debuted, along with the nicely skanking This Ain’t My Life) demonstrated that he could easily handle slower songs as well as the Skin crunchers, a great Reggae love song that must have been the cue for catching the eye of your desired partner in the dancehall. Moon Hop itself still captures the thrill of joyous abandon and I Wish I Was An Apple has some great sax adding to the slightly unorthodox subject matter. Whether it is throwing in a light Funky feel into Just A Little Lovin’ or reaching right back to the Blues on Oh Babe (Sick And Tired), Morgan and his musicians always strike just the right touch. No wonder the Moon Hop LP was a big seller and remains well loved today. Moving onto the bonus tracks, we have 14 extra offerings from around the same time as the original album (1968-70), released by the network of Pama labels (mainly Crab, but also Unity and Pama itself). Among them are plenty more highlights, Derrick’s standard of work at the time was usually pretty high. He knew how to keep things interesting lyrically and musically while also catering for the dances with some hot rhythms. In the company of Lloyd Campbell and Denzil Dennis he even conjures a pretty good go at recasting Twist And Shout in a Reggae mode as the Black Beatles! Who’s Making Love uses the Moonstomp rhythm but throws in a nice bit of Soul organ too. Though a lot will know A Rockin’ Good Way from the Shakin’ Stevens/Bonnie Tyler duet in the 80s, here between the singers (Derrick and Jennifer Jones) you get a real sense of chemistry – it works far better. The busy and cool rhythm of What A Thing catches the ear also, but there is a pleasingly high quality on show throughout. The second disc here presents the earlier 1969 album Derrick Morgan In London, actually a collection of singles cut back in Jamaica. There is more reliance on R&B cover versions here than on Moon Hop, but as Morgan’s raw voice could always do that kind of song justice, it isn’t necessarily a bad thing. Indeed he does a great job on the Pomus/Spector song My First Taste Of Love and there is a creditable attempt to recast the old Ben E King number Stand By Me into a rhythm-busting Reggae track. Too Bad harks back to Rocksteady’s slower groove and a jaunty Make It Tan Daey is highly enjoyable. Some nice guitar work enlivens Come What May and River To The Bank is a superb set closer, a very cool version of a traditional Jamaican number with an appealing flute line. We get another 10 bonus tracks on this disc, compiling everything else Morgan released on Pama. These include some of his big Jamaican hits like Belly Woman and Time Hard, which made an impact over in the UK too if not quite conquering the charts. The latter owes a bit of a debt to Lee Perry’s People Funny Boy, but certainly makes cuts the mustard. Hey Boy, Hey Girl is the joker in the pack, with George Dekker reaching high to replicate a female vocal in the duet! Bringing the collection to a close is a very neat 1970 version of Fat Man, drenched with echo and Dub effects. This is another fine 2CD pairing by Doctor Bird – Derrick Morgan may have kept a lower profile in recent years, but at the time when the Reggae beat was born, few understood it better and produced such a fine body of work. Also there is great news that Derrick is still out there touring and is due to play some shows in the UK this year. Moon Hop: Expanded Edition is ample proof of his prowess in producing high quality original Reggae grooves and damn fine listening to boot.